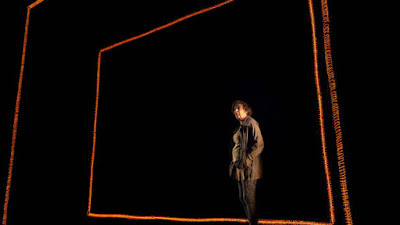 In terms of info, here’s what [I think] it is: Escaped Alone is the latest play by the much-loved, much-feted, British “experimental playwright” Caryl Churchill. It is fifty minutes long and is essentially a re-jigged cross between part three of her own play Far Away (2000), intercut with part two of Martin Crimp’s In The Republic of Happiness. That is to say, it’s a picture of “the concerns of modern society” presented as a series of oblique, truncated lines; something like speed-reading a copy of the Daily Mail, while the outrages whizz by, interrupted by surreal, whimsical descriptions of possible apocalypses. It says everything about Britain – British writing, British staging, and this staging in particular – that it’s the conversations that feel interrupted by the apocalypse monologues and not the other way around. The dialogue parts take place in a beautifully realised, fully naturalistic depiction of an English back garden, replete with creosoted 5ft fence, a shed, and an only slightly wrinkly blue sky. Of course, it’s idiotic to jump straight in and start prescribing away – like that Harry Enfield character – before I actually offer an analysis of what *is* there. But, honestly, what is there feels so ludicrously over-legible, so underlined, that it feels almost silly pointing out the obvious possible and potential symbolism of, say, gardens: “from Eden to Homebase in one easy visual metaphor, dwelling on the state of the lawn (not ‘manicured’ like Plath’s, let’s say), and maybe the incidental symbolism of The Shed (representing the absent men? Standing in for Industry opposed to nature? Where there’s something nasty. Etc.). I don’t deny it’s all in there. Or that it adds to the piece that we experience the flashes between the familiar (if we’re familiar with middle-class back gardens, which, if we’ve got a telly, we should be at least a bit, right?) and the motr makeshift set for the unfamiliar. 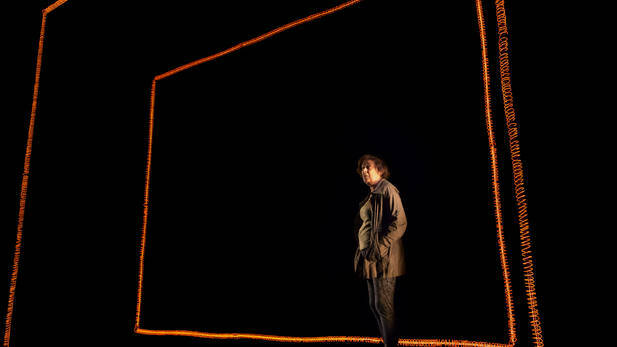 The monologues take place between two neon frames so that the audience can’t see the garden any more, only the figure delivering the monologue. The frames of neon are arranged to look a bit like huge lightbulb filaments. (No particular idea why.) As I say, of the two elements in the staging, it is these monologues of whimsical apocalypse that feel like the afterthought; the problem to be solved. The garden takes more time and more space. So these “interventions” feel relegated; made unreal in a world where realism takes precedence. I don’t want to prescribe the reverse (although I’d be interested to see the production that did do this), but it still feels like an effect worth noting. Similarly, there are moments in the piece where each other woman in turn delivers something like a brief soliloquy from their garden chair. For these moments too, the lighting is dimmed around them and they find themselves softly spotlit. It feels almost like a pathologically literal approach to the text’s “experiments”. “THIS BIT IS *EXPERIMENTAL*! FFS, WATCH OUT; IT’S AN EXPERIMENT!” shouts the lighting. So, yes; it’s an odd thing. I get that Escaped Alone is theoretically pretty good. I essentially like the sort of thing it’s doing. I should be in sympathy with its strategies for doing what it’s doing. But for some reason, in this production, at least, it felt like I wasn’t. Sorry.